When I was offered the chance to write about United’s best ever centre-backs, as part of a Best XI feature, I jumped with excitement at the opportunity, without realizing that I was facing two huge tasks. The first is that compiling a list (no matter the subject) is never easy and always likely to leave somebody disappointed or with enough ammunition to argue the choices that have been made. The second, and more practical, is that for a club such as United, whose tradition has largely been built on an attacking approach, with all the flair and panache of midfielders, wingers and strikers, it’s easy to forget how blessed the team has been over the years, with some great centre-backs gracing Old Trafford’s turf. This is a list of (arguably) United’s best 10 centre-backs: some might seem obvious choices, some might not, some might even seem totally unjustified and spark a debate, but isn’t this the point of writing a list? 1. 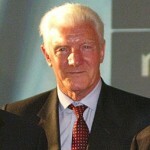 Bill Foulkes (1952-1970) (688 Appearances, 9 goals). “They just don’t make this sort of players anymore” might sound like an old cliché but, in Foulkes’ case, this is nothing but the truth. Talent was in the genes in the Foulkes family, Billy’s granddad a former St.Helens club captain and England rugby international, while his father also played rugby league for St. Helens. Billy showed an abundance of talent over 18 years of loyal service to the Red shirt. Signed by Sir Matt Busby as an 18-year-old miner (job that he kept part time even during his early days of his playing career), he went on to captain the club in its darkest hour, after Munich, leading the team to a hugely emotional FA Cup final at Wembley only 3 months after the crash. A man that relished the physical battle like no other, was a commanding figure at the back, the cornerstone upon which Sir Matt laid the foundations of its team. Inexplicably awarded only one England cap, he was an ever-present figure for United in the seasons 1957–58, 1959–60, 1963–64 and 1964–65. He scored the crucial goal in the 1968 European Cup semifinal against Real Madrid at Bernabeu as United came back from 3-1 down at half time to draw 3-3 to book their spot in the final against Benfica. After the Wembley triumph, Foulkes admitted that it had helped him “get over Munich.” Foulkes held United’s appearance record until Bobby Charlton overtook him, and his trophy cabinet boasts 4 league titles, 1 European Cup and 1 FA Cup. 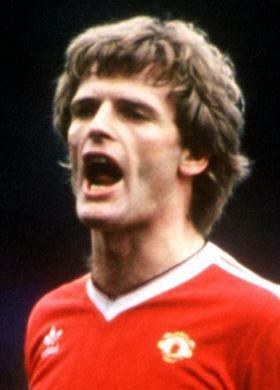 After his playing days he managed United’s youth team until 1975, when his spell of 25 uninterrupted years at the club came to an end. A true legend. 2. 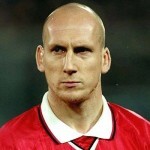 Jaap Stam (1998-2002) (127 Appearances, 1goal). Forget about the controversy surrounding his departure, Jaap Stam was a key figure at the heart of United’s back four at the turn of the millennium. The Dutchman had the fear of God put into his opponents (“Yip Jaap Stam is a big Dutchman”, became a favourite with the Old Trafford faithfuls), through a mixture of tough tackling, great awareness and a sense of position second to none. 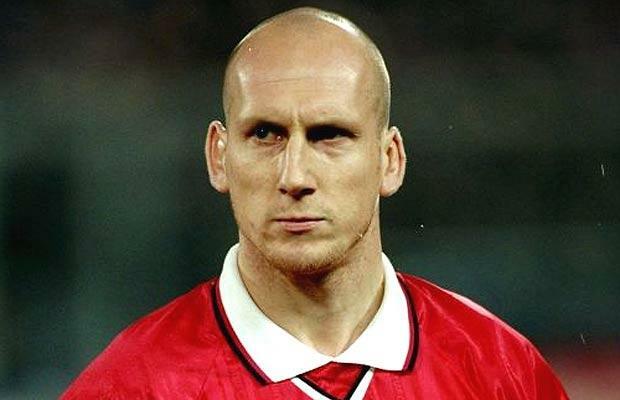 Composed and even elegant for a man of his size, Stam was part of the Treble-winning side in 1999, won 3 league titles in a row (1998-1999, 1999-2000, 2000-2001) and an Intercontinental cup in 1999. 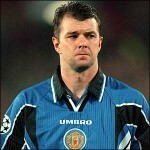 He was also voted best defender of the UEFA Champions League in 1999 and 2000. Perhaps the best quote to describe his importance to United came from Fergie himself, when he declared that he had regretted the choice of selling Stam to Lazio. 3. Rio Ferdinand (2002- present) (367 Appearances, 7 goals). Arrived at Old Trafford from arch-rival Leeds with the tag of most expensive defender in the world (twice) and – at the time – most expensive British footballer in history, Ferdinand took some time to settle, but has since became an integral part of United’s defensive unit, as well as establishing himself as one of the finest centre-backs in world football. Fulfilling all the modern day footballer’s requirements, Ferdinand is extremely composed on the ball and combines his great distribution with pace and great awareness. In a career recently plagued by fitness problems, Ferdinand’s finest hour was undoubtedly captaining United to their third European success in a rain soaked Moscow in 2008. The pictures of him sprinting towards Van der Sar after the Dutchman had saved Anelka’s penalty and of him and Ryan Giggs lifting the trophy together are memories that United fans will cherish for a long, long time. 2008 was arguably Rio’s best season at United, as he was voted in the PFA Team of the Year for the second consecutive season. 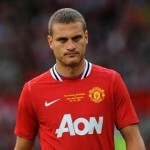 Despite his injuries, his partnership with Nemanja Vidic is probably the best in the world in terms of centre-backs. 5 League titles, 1 Champions League, 2 League Cups and 1 FIFA Club World Cup complete his honours. Oh and how can we forget about that last minute winner against Liverpool in front of the Stretford End? 4. Allenby Chilton (1938-1955) (391 Appearances, 3 goals). In an era when England, as well as the rest of Europe, had other more pressing matters to face than football, the fact that a future United captain had been signed from Liverpool had, perhaps, gone lost. Chilton joined United from their Merseyside rivals in 1938 and, despite his career being cut short by the war, went on to play almost 400 times for the club, with an astonishing 175 consecutive appearances over a period during which he missed only 13 games in 9 years. Chilton was a key figure at the heart of the defense of Busby’s first post war team and tasted success in the 1948 FA Cup final as United beat Blackpool 4-2. A league winner in 1952, Chilton requested a break from first team football after that amazing streak of consecutive games, which paved the way to the starting eleven for Mark Jones, one of the many emerging Busby babes. Often a forgotten figure in United rich history, Chilton captained the club between 1953 and 1955. 5. Martin Buchan (1972-1983) (456 Appearances, 4 goals). 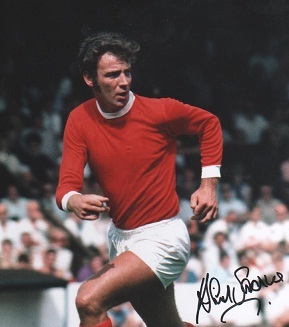 Aberdeen-born Buchan was United’s record signing when he completed his move to Old Trafford in 1972. His career at the club didn’t get off to best of starts, with United relegated at the end of the following season. Buchan didn’t leave the sinking ship though, as he helped United to regain top-flight status a year later. 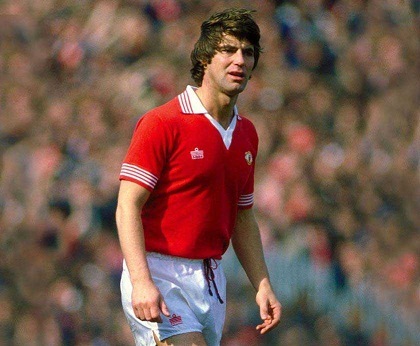 He was then appointed captain and led the team to lift the FA Cup in 1977 – and, by doing so, stopped Liverpool from claiming an unprecedented treble – which made him the first player to captain a side to both FA Cup and Scottish FA Cup glory. 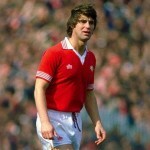 He was part of the side that won the FA Cup in 1983, but did not make the team for the final. Cool and composed under pressure, the Scot was a cult hero with the fans, for his courageous attitude and commitment to the cause. Some years later, another Scot would follow his path down from Aberdeen. His name was Alex Ferguson. 6. 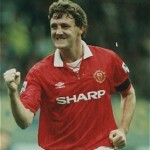 Steve Bruce (1987-1996) (414 Appearances, 51 goals). Ask any United fans what’s their favourite Steve Bruce moment and most of them will formulate a two words reply: Sheffield Wednesday. With only a few games left in 1993 United were seemingly heading for defeat, Bruce scored twice in the dying stages to send the fans berserk and crucially turn the league in United’s favour. He was the first United captain to lift the League title in 26 years, and also the first ever captain to lift the Premier League trophy. 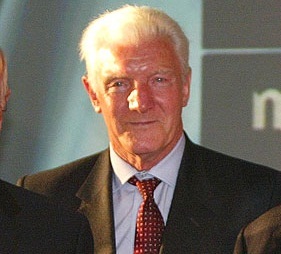 In 1994, he became the first English captain to win The Double in the twentieth century. Rejected by a number of clubs in his youth, Bruce gradually began to find his feet in football after quitting his job in a shipyard and went on to play for different First Division clubs before signing for United in 1987. 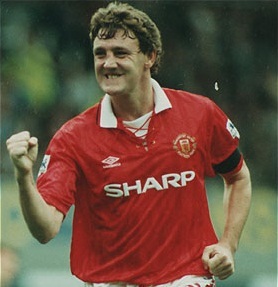 With the arrival of Gary Pallister in 1989, Bruce had found a partner with whom he had an unbelievable understanding, and together they piloted United to domestic and European success thanks, in no small amount, to Bruce’s contribution at the other end of the pitch: 51 goals are a remarkable tally for a centre-back. In 1991 he finished as the club’s joint top scorer with 19 goals in all competitions. Bruce almost scored a famous goal in the 1991 European Cup Winners’ Cup final against Barcelona, only for Mark Hughes to get the final touch. The uncompromising centre-back left United in 1996 with 3 League titles, 3 FA Cup Winner medals, 1 League Cup, 1 European Cup Winners’ Cup and 1 European Super Cup. Incredibly never played for England. 7. Gary Pallister (1989-1998) (437 Appearances, 15 goals). The other half of the “Dolly and Daisy” couple, as him and Bruce were affectionately known, was an imposing, yet pacy, figure in the United back four. The partnership with Bruce flourished instantaneously and yielded three Premiership titles (1993, 1994, 1996), two runners-up spots, the 1991 European Cup-Winner’s Cup and Super Cup, three FA Cups (1990, 1994, 1996) and the League Cup of 1992 to which he added another title in 1996-1997, after Bruce’s departure. Voted PFA Player of the Year in 1992, he missed only 9 league games between 1992 and 1995 and, although his scoring instinct wasn’t quite as developed as Bruce’s, he did score some important goals. Most famously, a brace at Anfield in 1997 virtually sealed the title for United. 8. 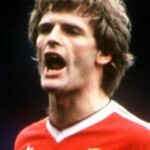 Gordon McQueen (1977-1985) (229 Appearances, 26 goals). “Ask all the players in the country which club they would like to play for and 99% would say ‘Manchester United’. The other 1% are liars” This is how the Scot introduced himself to the Old Trafford faithful after signing from bitter rivals Leeds United. A no-nonsense centre-back, McQueen scored United’s first goal in the 1979 FA Cup final defeat against Arsenal, before eventually picking up a FA Cup winners medal in 1983. He was still at the club two years later when United lifted another FA Cup, although he did not make the team. Left the club in 1985, as a young Paul McGrath made his way into the starting eleven. 9. 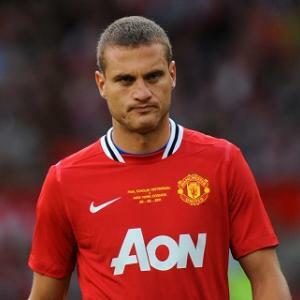 Nemanja Vidic (2006-present) (236 Appearances, 18 goals). United’s current club captain took some time to adjust to English football but, after a shaky start, his talent began to shine, and he hasn’t looked back. Made captain at the beginning of last season, a role that he defined as a “huge honour”, Vidic ticks all the boxes of a Unted captain. A man-mountain centre-back whose aerial ability and strength make him a tough client for any striker in the world, has also come up with the goods at the other end of the pitch. A cult hero with United fans because of his “heart on the sleeve” approach, captained the club to a record breaking 19th league title last season and he was also named PFA Player of the Year. He looks certain to add to his tally of 4 Premier League, 1 Champions League, 1 FIFA Club World Cup and 3 League Cups. 10. David Sadler (1963-1973) (335 Appearances, 27 goals). Way before rotating players and versatility became essentials aspects of football, Sadler was a modern footballer. He could play as a centre-back – where he played for most of his career – midfielder and even as a centre-forward. 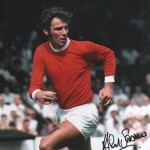 During 10 years at United he won the league twice (in 1965 and 1967) and lifted the European Cup in 1968. Starting as centre-back (probably the only centre-back to ever wear a number 10) in the final, he was faced with the nearly-impossible task to contain Eusebio, and he did brilliantly to limit the Portuguese. Curiously enough he started his football career with Maidstone United before signing for United, the same path followed by Chris Smalling more than 40 years later. So, who are United’s two greatest centre-backs, the formidable pair that you’d name when faced with the ever-difficult question “Who would you pick if you were to name United best XI ever?”… Foulkes’ leadership, Bruce’s goalscoring abilities or Vidic courage? Should Rio get the nod ahead of Gordon McQueen? As fans we know that this topic can lead to endless discussions, in a pub, on the way to away games or during those long boring summer months without football. For me the choice was just as complicated, also considering that I’m too young to have seen half of them in action, but, after thinking it over and over, the following two are the two player that I’d love to see at the hearth of any United’s back four. Steve Bruce: a natural-born leader, who truly led by example. His positioning and timing would have seen him walking into any team during his career. A superb header of the ball, and extremely composed he was always in control with or without the ball and could prove to be a fantastic weapon at the other end of the pitch too. Nemanja Vidic: we all want a United captain to be prepared to put himself on the line for the club, and to show the same emotions and passion that run deep into every Red’s veins. Vidic epitomizes these qualities. In my opinion he just gets the nod ahead of Stam for his longer spell at the club and for being capable to chip in with a few important goals too. But what about having Rio and Gordon McQueen? Or maybe Pallister and Sadler? Well, the debate could go on forever, you simply can’t choose. And let’s not forget that with young Phil Jones and Chris Smalling establishing themselves so quickly in the first team, we might have to update this list in a few years time. Both are a bit short on pace. I’d replace one of them with Stam who has great pace, is as strong as they come, really tall, and does not have Rio’s lapses in concentration. Stam and Vidic would be a scary proposition for any forward line. Stam is quicker than Bruce, but Bruce was much more of a threat on set pieces, which is why i picked him and Vidic. To be fair though, i get your point and I have to admit that Stam and Vida would be a formidable combination. Boys – just to let you know, the UK text comp has had very few responses so if you haven’t already had a go you might as well for a quid, someone’s got to win the shirt and with so few entries and it closing on Monday your odds are fairly decent. Check out the competition page for more info. WHERE’S PAUL McGRATH? I DEMAND TO KNOW?! Injuries (and a penchant for beer) probably keeps him from being in the final pair for me. One of the most gifted defenders ever, he had everything except being consistently available to play.